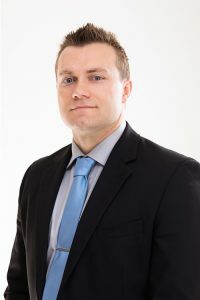 James is an associate attorney at Van Hooser & Eftink, P.C. He was born in Kansas City, Missouri. While in law school at Mizzou, James worked in the school’s criminal prosecution clinic, prosecuting criminal cases with the Boone County Prosecutor’s office. James also was a member of the Missouri Law Review and an article he wrote was published in the Spring 2010 issue. As an attorney, James has tried cases in the Missouri counties of Jackson (both in Kansas City and in Independence), Cass, and Bates, as well as giving oral argument before the Court of Appeals. James is licensed to practice law in the states of Missouri and Kansas. James is currently the president of the Cass County Bar Association. James is married; his wife, Lauren, is a registered nurse. James is the son of Gerard.